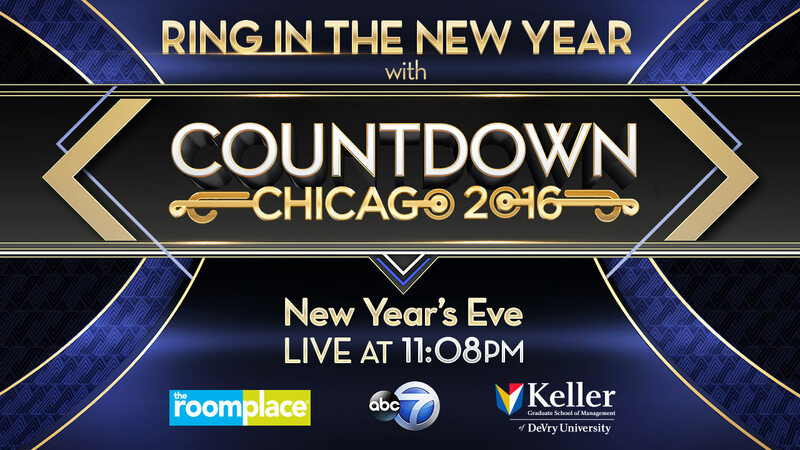 CHICAGO (WLS) -- ABC 7's 25-year tradition on New Year's Eve is still going strong! The longest running local New Year's Eve show, watched by the most Chicago television viewers at Midnight -- COUNTDOWN CHICAGO -- will once again ring in the New Year! This special program features the hottest parties, musical talent and spectacular fireworks in and around Chicago. December 31, 1991 marked the beginning of ABC 7's annual broadcast of New Year's Eve specials. ABC 7's Janet Davies and Mark Giangreco, two of Chicago's most recognized broadcasters, will celebrate their 15th anniversary ushering in the New Year together as co-hosts of the 2016 special, Thursday, December 31st from 11:08 pm-12:15 am on ABC 7. Joining Davies and Giangreco for the biggest night of 2015/16 are ABC 7's Eyewitness Anchors Alan Krashesky, Terrell Brown, Hosea Sanders, meteorologist Cheryl Scott and from ABC 7's Windy City LIVE, Val Warner, Ryan Chiaverini and Ji Suk Yi. Co-hosts Mark Giangreco and Janet Davies will get this party started in Chicago when they kick things off inside the JW Marriott's Burnham Ballroom in Chicago. Live bands and DJs will keep the party rocking throughout the evening. Rosemont will be jumpin' when Ryan Chiaverini, Val Warner and 18,000 of their best friends all converge under one-roof to dance to the red hot beat of Chicago's own phenom, Chance the Rapper. At the stroke of Midnight, Chance the Rapper, recently named "Chicagoan of the Year" by Chicago Magazine, will perform along with one of the top DJs in the world, Skrillex, from the Donald E. Stephens Convention Center in Rosemont. Alan Krashesky and Cheryl Scott invite viewers to the festivities of Voyager 2016, presented by CANVAS at West Town's Moonlight Studios which will be transformed into an otherworldly atmosphere. There will be 15,000 sq. ft. of art installations, music, and projection mapping to journey into the New Year. Hebru Brantley, one of Chicago's most renowned artists, known internationally for his colorful and inspirational aesthetic will be DJing throughout the night. COUNTDOWN CHICAGO 2016 will spotlight the World television Premiere performance of Broadway In Chicago's Gotta Dance. The new Broadway-bound musical about professional basketball's first ever over 60 dance team will dazzle New Year's viewers with their television debut of the dazzling production number, "Swagger." Gotta Dance comes to the PrivateBank Theatre this winter. And once again, COUNTDOWN CHICAGO will bring in the New Year with a bang with Navy Pier's signature fireworks extravaganza. An annual favorite among viewers, ABC 7's COUNTDOWN CHICAGO consistently ranks as Chicago's #1 program in the time period. In 2014, ABC 7 did a 17 rtg with a 40 share at midnight which means it was seen in 701,000 homes.